GoodBelly Probiotic Juice Drinks are marketed as an easy way to take in digestive healthy probiotics. Each product contains a dose of the probiotic Lactobacillus plantarum 299v (Lp299v). 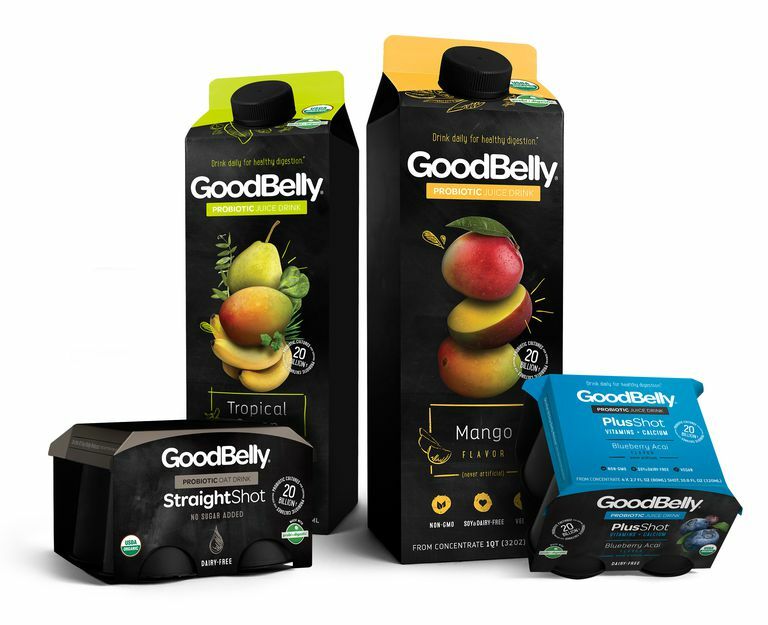 GoodBelly products can be purchased by the carton or in fun kid-sized cups. GoodBelly also offers a probiotic supplement. The company offers two flavors of juice that are gluten-free. The manufacturers of the GoodBelly products state that they chose the probiotic strain Lp299v for their products due to the fact that this strain appears to be especially suited to survive the acidic environment of the stomach and thus make its way into the large intestine where it theoretically contributes to a healthy bacterial balance in the gut. A number of live units of probiotic cultures per serving varies depending on the product offered. Most GoodBelly products contain 20 billion "colony forming units," while GoodBelly SuperShot contains 50 billion units. The manufacturers recommend one serving per day, with the expectation that you will see results within 12 days. The people at GoodBelly are running an ongoing promotional event called the 12 Day Belly Reboot. If you sign up, you will receive coupons for GoodBelly products. They then offer a money back guarantee: If you are not satisfied with the products or with your results, the company will refund the money you spent on the products. Blueberry Acai: This one is absolutely delicious and should appeal to all. Mango: This one is interestingly tropical and thus should appeal to anyone who enjoys a tropical drink. Pomegranate Blackberry: This one is a little tart, but certainly pleasing. Tropical Green*: Delicious, at least for a person who is a green juice drinker. Your palate may think differently. The company has a commitment to healthy ingredients. Fruit juices are one way to take in more of those health-promoting phytonutrients that you get from eating fruits. Except in some rare cases, there does not seem to be a downside to the use of probiotic supplements, and there are research studies that suggest that such supplements do help to improve digestive functioning and support the immune system. On the other hand, researchers have not yet come to firm conclusions as to how it is that probiotics actually work. And although there are some preliminary studies on the Lp299v strain, there is no published research that GoodBelly products themselves can improve one's health. That being said, if you like juice, then GoodBelly Probiotic Juice Drinks would be an easy, delicious way for you to take in some probiotics, as well as help you to get in your "five a day" servings of fruits. If you have irritable bowel syndrome (IBS), it might be reassuring to know that the American College of Gastroenterology recommends the use of probiotics in its treatment guidelines. However, juice drinks tend to be high in the carbohydrate fructose. Thus if you have a fructose intolerance, or are following the low-FODMAP diet for IBS, GoodBelly Probiotic Juice Drinks would not be for you. Didari T. Effectiveness of probiotics in irritable bowel syndrome: an Updated systematic review with meta-analysis. World Journal of Gastroenterology. 2015;21(10):3072. doi:10.3748/wjg.v21.i10.3072. Ford A, et.al. "American College of Gastroenterology Monograph on the Management of Irritable Bowel Syndrome and Chronic Idiopathic Constipation. American Journal of Gastroenterology 2014 109: S2-S26. Quigley E. Therapies Aimed at the Gut Microbiota and Inflammation: Antibiotics, Prebiotics, Probiotics, Synbiotics, Anti-inflammatory Therapies. Gastroenterology Clinics of North America 2011 40:207-222. Are There Any Advantages of Juicing for People With IBS?